Anambra North Senatorial District which is comprised of seven local governments has two major regions which are located on two divergent sides . The Onitsha - Ogbaru region on one side and the Omambala region on the other side. If grouped into federal constituencies, this region has two which are Onitsha North and South Federal Constituency and Ogbaru Federal Constituency. It is worthy of note that Ogbaru is on its own a federal constituency due to its large size and population. Between the two regions in Anambra North, this region has forty nine wards and has a voting strength of about 70% out of the voting capacity of the Senatorial District. Since the advent of democracy in 1999, this region has only produced two senators, that is a Senator from each Federal Constituency, Senator Joy Emordi (Onitsha) and Senator Stella Oduah (Ogbaru). This is notwithstanding that the voting strength of this region far outweighs that of the Omambala region. This region equally has two federal constituencies namely: Anambra East and West Federal Constituency and Oyi/Ayamelum Federal Constituency. It has 50 wards, however, with a voting strength of about 30% in the Senatorial District. Though it possesses only 30% of the voting capacity of Senatorial District, it has since 1999 produced four senators for Anambra North. They are Senator Emma Anosike (Umuleri), Senator Alphonsus Igbeke (Nsugbe), Late Senator Chuba Okadigbo and his wife, Senator Margery Okadigbo (Nteje). This means that the Anambra East and West Federal Constituency has produced two senators (Senator Igbeke and Senator Anosike) while the Oyi/Ayamelum Federal Constituency has produced 2 Senators (Late Senator Chuba Okadigbo and his wife Margery Okadigbo). The Governor of Anambra State also hails from Omambala region. 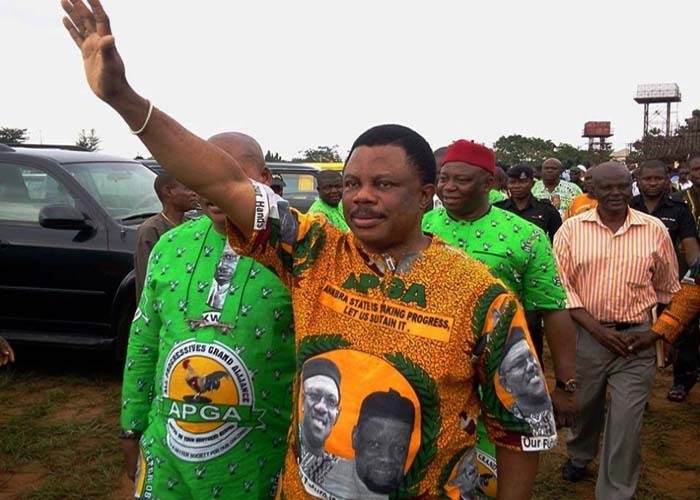 The Governor of Anambra state who hails from Aguleri in the Omambala region is currently serving his second term. During his campaign for his second term, he strenuously campaigned in the Senatorial District and appealed to the peoples' conscience that being from Omambala, the Senator representing his constituency must come from the other region. Of course this made sense as Omambala cannot be expected to have both the Governor and the Senator for the district. With this mind, and with the fact that the same Omambala has produced 4 out of the 6 senators who have represented Anambra North and again coupled with the fact that each federal constituency in Omambala has produced two senators while Onitsha and Ogbaru only produced one each, equity and fair play dictate that the next Senator should come from the Onitsha/Ogbaru region. Much is indeed expected from Governor Willie Obiano for the Onitsha//Ogbaru region voted him massively. For Ogbaru, despite that there was a Governorship candidate from Ogbaru in the last election, Ogbaru gave the Governor their votes and thereby made Omambala the champion. In a true democratic setting, rotation of power otherwise called zoning in this instance is indispensable. It was based on this pedestal that a Governor from Anambra North was agreed upon and fought for by all. The Governor enjoys the result of that equity and fair play and hence enjoys the wide acceptance from all quarters of the State. If that fairness which gave the Governor a second term in office was violated, perhaps Anambra South or Central would have altered the equation which we now have. Today, Governor Obiano in this stance represents the true image of the common will of the Anambra People to rotate power. He is to a large extent symbolic of the principle of zoning in Anambra State. It is hoped that neither the Governor nor any of his allies will violate this fundamental principle of equity and fairness, especially in the Governor's own Senatorial District. Anybody who encourages any such deviation would be desecrating what the Governor stands for and will constitute a menace to the democratic serenity in Anambra State and will be rejected by all as a persona non grata. That deviation will be an affront to our Governor in his own constituency. If the left hand washes the right, the right should reciprocate. We are watching! !